Americans have real reason to fear a health care catastrophe: If loved ones suffer major injury or illness, who will feed, bathe, and care for them 24/7 after they get out of the hospital and recuperate at home? Who will take time off from work to set up and take them to unending and long medical appointments? Who will wait for and get all the pills and devices they need? Americans spend so much time debating so many aspects of health care, including insurance and access. Almost none of that covers the actual impossibility and hardship faced by the many millions of friends and family members who are caregivers. It’s hugely disrupting and expensive. There’s no system for it. It’s a gaping hole. In many respects he was lucky. He had great insurance. He had enough money. Partly because one of his friends (me) is well connected in the health care system, he got excellent care. So, this is not a story about how the system failed, or how people need insurance or access. He had those. He got the care. This is the United States health care system at its peak performance. But I was utterly floored by how hard it all was. In a 2010 paper, researchers estimated the economic burden for caregivers of patients with lung and colorectal cancer. They reported that the average cost to a caregiver in the initial phase of treatment was more than $7,000. After treatment, almost an additional $20,000 was spent on ‘continuing’ care. A study published in Cancer the year before found that over a two-year period, caregiving costs were more than $72,000 for lung cancer, $66,000 for ovarian cancer, $59,000 for lymphoma, and $38,000 for breast cancer. 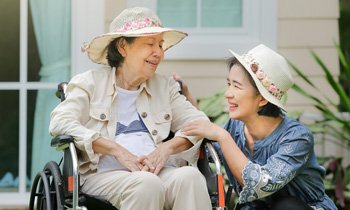 The American Cancer Society’s page offers a lot of sympathy for caregivers in these situations, but it acknowledges that for many, there really aren’t any solid solutions other than asking for help from those around you. Carroll says federal laws offer spare support— three months of personal work leave. But it’s unpaid. And it only applies to those who work for companies with 50 or more employees, leaving 40 percent of the workforce out of luck. Further, only a spouse, parent, or child qualifies. Other nations aren’t doing better. That’s still only a start in dealing with what researchers from the independent and nonpartisan RAND Corporation say is a significant, costly, and rising long-term care challenge for our fast-graying nation. It faces a future with millions who will be debilitated by dementia and Alzheimer’s. And even before families get crushed by caregiving, of course, Americans too often are staggered by bankrupting medical costs, notably by the “financial toxicity” of short- and long-term cancer treatment with pricey prescription drugs. In my practice, I see not only the harms that patients suffer while seeking medical services, but also their struggles to access and afford safe, efficient, and excellent medical care. This has become a daunting challenge with the soaring complexity, uncertainty, and cost of medical therapies and prescription medications, drugs that too often prove to be dangerous. Patients and their loved ones may feel as if the world’s turned upside down and against them with normalcy never to return. We’re all a breath away from catastrophic medical needs due to injury (a car wreck on the way home) or the sudden onset of major illness. But research shows the finances of too many Americans already are precarious, and they are stretched ever thinner by health care costs, apparent and less so. That makes even more unfathomable the Trump Administration’s relentless campaign to gut federal help for Americans with health insurance by trying to strike down the Affordable Care Act, as well as by slashing medical services to the poor, chronically ill, disabled, children, and aged via programs like Medicare and Medicaid. By legal actions in the courts, by public statements light on facts, and with punishing budget submissions, the administration—and congressional Republicans—have given a not-our-problem response to Americans’ health and wellness needs. The harshness of this extreme view can be seen by comparing how partisan politicians have lavished more than $1 trillion in tax cuts on wealthy corporations and the most affluent among us, revenue-slashing moves that are beggaring the national treasuries. Opposition forces may be able to turn back the administration’s most Draconian plans: One federal judge has blocked Arkansas and Kentucky, as well as potentially seven more states from putting in place bureaucratic rules to compel Medicaid recipients to seek jobs or to work to maintain benefits. Another federal judge has nixed administration proposed “association plans,” seeking to let small businesses and link-minded people band together to offer lower-cost health coverage that also doesn’t meet ACA standards. Maybe, as the president and his allies have promised for years now, they will stop pretending and offer real, concrete, and workable alternatives to Obamacare and other safety net programs they have tried to dismantle. Again, they haven’t done so. We’ll see. We’re 19 or so months from the 2020 presidential election.